The day of reckoning dawned last Tuesday, as the country psyched itself up to receive the word of the Minister – and while it was good news for the under-5s, it was bad news for students and young jobseekers. The Registration Fee will go up a further €250 next year, and while the grants for students remained untouched there are still considerable delays in students actually receiving it. “Young people are seen as a soft target”, said Mary Cunningham of the National Youth Council of Ireland. The cut of €44 per week in the Jobseeker’s Allowance for people aged 21-24 has been widely condemned, with Saint Vincent de Paul slamming the government, saying “it would appear that the government is conveying a message (to jobseekers under 24) that emigration is their only option”. Minister for Social Protection, Joan Burton defended the decision to reduce the allowance to €100 a week, saying that “young people are financially better off in education, employment or training than claiming”. However, opposition TD Richard Boyd Barrett countered that the cuts of €25 million to the third level sector, combined with the cuts to the Jobseeker’s Allowance, “is a government message to young people telling them to just get out of the country on a tax-free Ryanair flight”. Ógra Fianna Fáil President, Kate Feeney, has called on the youth wings of all political parties to come together and stand against the Government’s cuts to Jobseeker’s Allowance for people aged between 18 and 26. Ms. Feeney commented, “The decision in the Budget to cut unemployment support to people under-26 is deeply unfair, regressive and will certainly drive more and more young people out of the country. The Government should immediately reverse this decision and I hope that my counterparts in the youth wings of all political parties in Ireland will join us in calling on the Ministers to do so”. 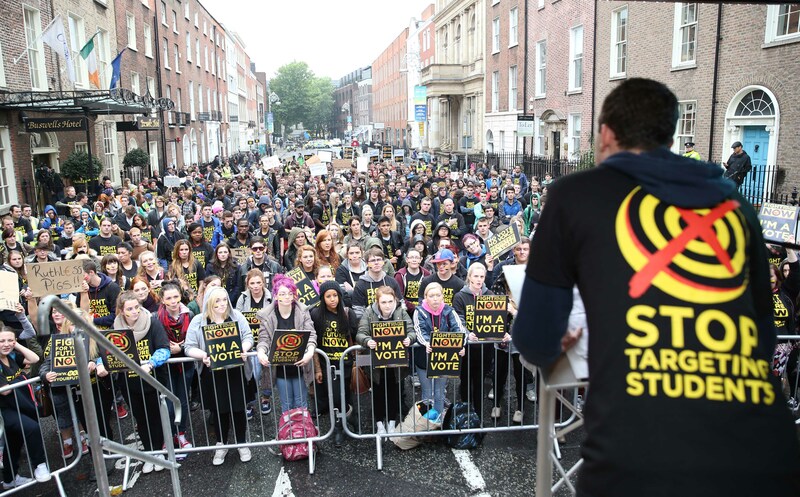 Recent DCU graduate and member of the United Left Alliance, Declan McCool denounced Budget 2014 as “a savage attack on the youth of this country” and called the €14 million pledged towards youth services “a minute figure….a drop in the ocean”. The government expects the cuts will attract more young people back into education and training, and with the Back to Education Allowance at €160 per week and JobBridge internships adding €50 to people’s weekly dole, it might feasibly work as an initiative to get more young people active in the workforce.